Some plans didn't work out very well. My oldest son secured a weekend job and announced he wouldn't be joining us on any camping outings. Our big trip to Sacketts Harbor for the annual 1812 Lacrosse Shoot-out tournament was cancelled when the team didn't gather enough players willing to make the 100-mile journey. 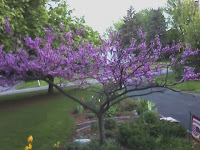 A couple other summer weekends turned drab and rainy on Friday night, so we stayed home. Other plans worked out better than expected. Sitting around the dining room table in early April with friends, we agreed impulsively to join them in late July for a stay at another Jellystone Campground near Mexico, NY. One week before the trip, my hard-working son unexpectedly announced that he would join us. We'd already invited our nephew to keep my youngest company, so we ended up with three boys in a tent pitched next to the camper. More than twenty of us gathered on Friday and Saturday night around a big campfire. 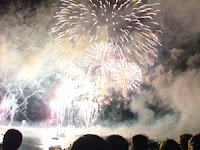 We attended one of the most amazing fireworks displays I've ever seen, honoring Harborfest in Oswego, NY -- just a few miles away from the campground. 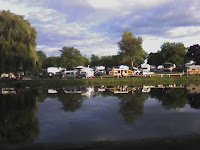 We try each year to assemble a family and friends gathering at our nearby KOA. That outing might still happen if the weather cooperates. Our 20-foot 1980 Shasta camper was gone for a while late summer, awaiting a full set of new tires. We left it there at the shop because other plans came up, including a delightful Saturday spent at our friend's house for their daughter's Sweet 16 birthday party. I took a violent face-hit during one wild dodgeball melee; but we had a wonderful time otherwise. Our final big trip of the year found us zooming off to Lake George, one of my favorite places. We'd considered taking the camper, but high gasoline prices flipped that decision to "hotel room." The weekend was spectacular and the resort was mobbed. 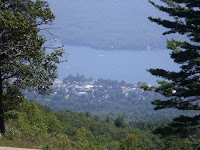 Despite some serious life complications back home, we made the most of our final summer sojourn and took some fabulous pictures of the Lake George valley from the mountain nearby. Now, suddenly, it's Labor Day weekend and another summer is ready to make way for school busses and falling leaves. I'm sitting on the back deck under my big green umbrella, composing this farewell to the season under a spotless blue sky. The temperature has climbed to nearly eighty from this morning's chilly fifty-three degrees; the sound of lawn mowers surrounds me, drowning out the CNN coverage of Hurricane Gustav's arrival in Louisianna. In past years we've scheduled this long weekend for a three-night camping trip. There's a huge hot air balloon festival held each year in Dansville NY, about 40 miles south of us. We've attended every year until last year - the weather was just plain awful in 07, and most of the festival was cancelled. It's a national-level balloonist gathering, though, and offers the chance to see between 40 and 70 simultaneous launches. It's breathtaking, and we've taken some almost unreal pics in the past. Our local Country music station used to spend the whole summer building up to a major show at this fest. Past performers (for $10 tickets) include Keith Urban and Rascall Flatts, leaving a dozen others unlisted. These past two years...nothing. Even the stupid Colgate Country Showdown Semi-finals, long a tradition there, are no longer held on Labor Day weekend. Not sure why, but it certainly has reduced the attraction for spending the entire weekend there. So this year it turns out we've passed up one of the most idyllic weekends of the entire summer. We worked all day Saturday, attended a family picnic Sunday, and spent today just puttering around. As I continue to watch the storm surge into New Orleans and surrounding parishes, I can't help but count our blessings. We've had a long, sweet summer after all. Though it seemed to pass us by in the blink of an eye, that's only an impression and not reality. Fall is on the way now, and could easily bring spectacular days to enjoy before winter takes over.